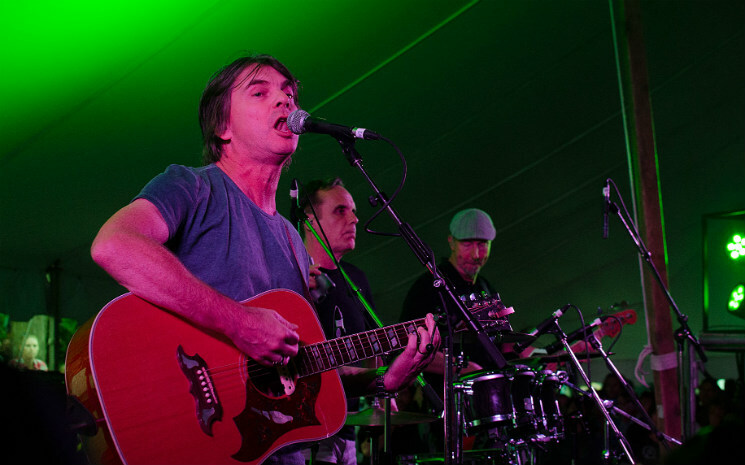 Canadian alt-rock mainstays to listeners of a certain age, 54-40's Riverfest appearance celebrated their recent greatest hits compilation, La Difference: A History Unplugged, which presents ten of the band's hits rerecorded in acoustic fashion. "Ten of our fifteen hits, actually," frontman Neil Osborne joked. Having only 45 minutes onstage under the tent meant little time for filler, resulting in a gratifying ten-song set of new life being breathed into older hits. Osborne took the stage solo first to perform "One Day in Your Life" with only a guitar and his voice, at times flirting with major keys, unlike its original recording. The full-band rework of "She La" saw Dave Genn (who joined the band in 2005) hop behind the piano to have the instrument fill the role of rhythm and lead guitar, while drummer Matt Johnson picked up a shaker to complement Brad Merrit's walking bass line. Further highlights included a solo piano version of "Crossing a Canyon," written by Osborne for his ailing father, "I Go Blind," with a reworked drum line and plenty of crowd sing-alongs, and a rework of their first single "Baby Ran" featuring a banjo.